In our Proverbs 31 Online Bible Study of Made to Crave Action Plan we have an assignment/challenge to make a shield with verses we can use to protect ourselves from the fiery darts the enemy throw a at us. Here’s mine. I printed it on card stock, backed it with scrapbook paper and used scraps of the scrapbook paper to make the dividing lines on the shield. Then I backed it with more card stock to make is sturdier. 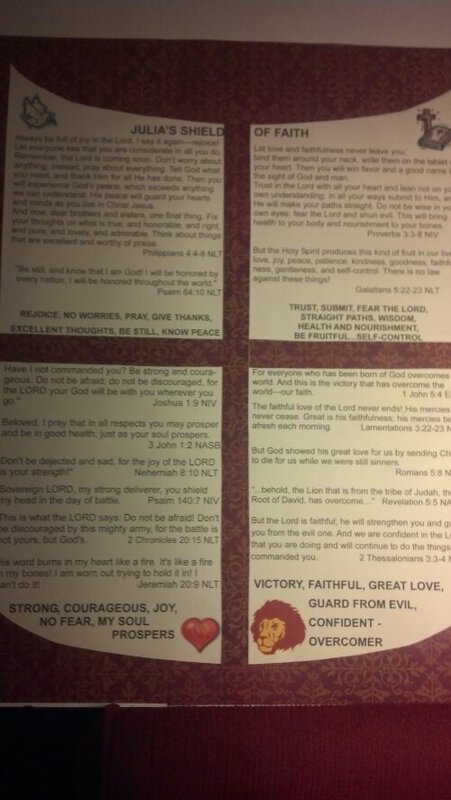 I used many of my favorite/go to/life verses on the shield. Then I added some clip art and key words from the verses to complete the shield. As they said over and over in the movie God’s Not Dead, God is good all the time. All the time God is good. If you haven’t seen it yet, I highly recommend this movie!